Did you know that April is grilled cheese month? I never knew until the Food Network posted it on Facebook a couple days ago. I'm a big fan of grilled cheese creations (as you may have seen from previous posts) so this is pretty cool news to me! I made a new one last week so it seems like the perfect time to post about it. I usually make my 'Grown Up' grilled cheese concoctions using simple ingredients because great tastes can be created using everyday things. This latest grilled cheese was no exception. Coming up with new and interesting combinations can be as simple as looking in the fridge (or pantry) and using a little imagination. Instead of spending a small fortune at the store or making special trips, I've become a big fan of using what you already have. I always have a selection of veggies and usually a pretty standard cheese on hand. Yes, I know that there are so many awesome cheeses out there, but they can be pretty costly. I had the basics and that's all I needed. Every once in awhile I'll splurge, but for most of my 'everyday sandwiches', I'm perfectly content using what I have to make something that tastes pretty awesome. This particular grilled cheese used a variety of veggies that were cooked to the peak flavor then sandwiched with a combination of cream cheese, mozzarella cheese and some select herbs to make an Italian-style delight. The key to the great flavor of this sandwich is in the vegetables - specifically the onions. They were caramelized to bring out all their natural sugars which added a nice depth and sweetness that complimented everything else perfectly. This version also has the bonus of chicken breast pieces to add substance and bring extra flavor. The beauty of a grilled cheese sandwich is the ability to be customized to whatever it is you're craving or whatever you have on hand, so have fun with this Italian-style idea and get creative! 1. Mix cream cheese, mozzarella and herbs together. 2. Spread on each slice of bread. 3. 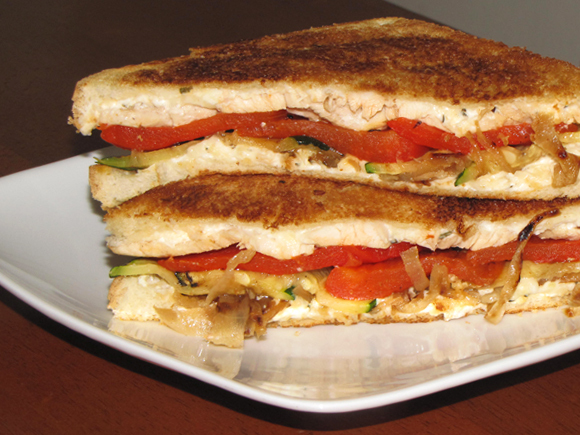 Top cheese mixture with chicken, red pepper, zucchini and onions. * To caramelize onions: Slice 1 sweet onion into thin slices. Heat about 1 TB olive oil in large skillet then add onions. Cook over med-high heat for about 5 minutes then reduce heat. Cook over low heat, stirring occasionally, for about 30-40 minutes. Onions should be cooked down and a deep, light brown color when done. **To roast zucchini: Slice into ribbons and toss with a little olive oil. Roast in 450 degree oven for 30-40 minutes or until golden. If you're not in the mood to roast zucchini, just slice half a zucchini into ribbons and cook in a skillet for about two minutes on each side, over medium heat. This will soften it, bring out more flavor, and get rid of the raw bitterness.